ahhh, my old roommate in the early 90's had this record. He used to slip it on when we would have acid parties at our house (i.e. "acid" the psychedelic, not the genre of music) and tell people about a curse it held. 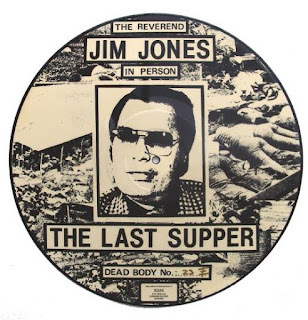 He claimed the number of records pressed was the same as the number of people who died at Jonestown, and there was some sort of spell in the recording that doomed whoever came into possession of this album to die or commit suicide or some nonsense. Needless to say it would always bug people out when he played it, he got a kick out of screwing with their heads while they were tripping.